NASA astronaut and Expedition 49 crew member Kate Rubins, who became the first person to sequence DNA in space, returned to Earth Oct. 29 after a successful mission aboard the International Space Station. 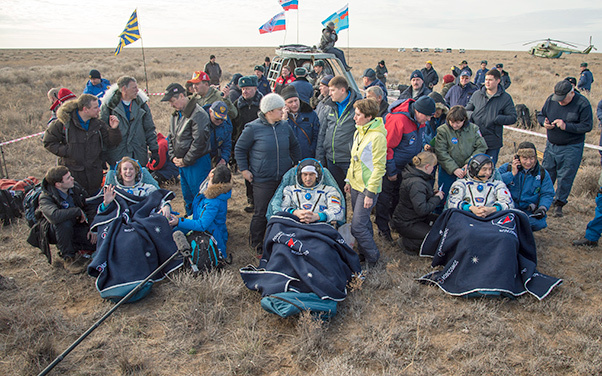 Rubins and her crewmates Anatoly Ivanishin of the Russian space agency Roscosmos and Takuya Onishi of the Japan Aerospace Exploration Agency, touched down in their Soyuz MS-01 at 11:58 p.m., EDT, southeast of the remote town of Dzhezkazgan in Kazakhstan. Rubins, who has a degree in molecular biology, contributed to several new studies taking place for the first time aboard the space station, including the Biomolecule Sequencer experiment. The ability to sequence the DNA of living organisms in space could enable astronauts to diagnose an illness, or identify microbes growing in the space station and determine whether they represent a health threat. During her time on the orbiting complex, Rubins ventured outside the confines of the station for two spacewalks. During the first one on Aug. 19, she and NASA astronaut Jeff Williams installed the first international docking adapter. Outfitted with a host of sensors and systems, the adapter’s main purpose is to provide a port for spacecraft bringing astronauts to the station in the future. Its first users are expected to be the Boeing Starliner and SpaceX Crew Dragon spacecraft now in development in partnership with NASA’s Commercial Crew Program. During her second spacewalk Sept. 1, Rubins and Williams retracted a spare thermal control radiator and installed two new high-definition cameras. Together, the Expedition 49 crew members contributed to hundreds of experiments in biology, biotechnology, physical science and Earth science aboard the world-class orbiting laboratory during their 115 days in space. The trio also welcomed three cargo spacecraft delivering several tons of supplies and research experiments. Rubins was involved in the grapple of Orbital ATK’s Cygnus spacecraft to the station in October, the company’s sixth contracted commercial resupply mission, and SpaceX’s Dragon ninth contracted mission in July. One Russian ISS Progress cargo spacecraft also docked to the station in July. Rubins and Onishi have each spent a total of 115 days in space during their first mission. Ivanishin now has 280 days in space from two flights. Expedition 50, with Shane Kimbrough of NASA in command and his crewmates Sergey Ryzhikov and Andrey Borisenko of Roscosmos, will operate the station for three weeks until the arrival of three new crew members. Peggy Whitson of NASA, Thomas Pesquet of ESA (European Space Agency) and Oleg Novitskiy of Roscosmos are scheduled to launch Nov. 17 from Baikonur, Kazakhstan.